The reason we “phone” is to get closer to a “yes”! The ultimate goal is to schedule an appointment, not to sell over the phone, you want their time face to face. When preparing to phone a potential client, the most important thing is to get your mind right. Listen to music, do the “superhero pose”, make it into a competition, or watch someone else do it. The goal is to get relaxed and into the right head space. While on the phone with someone, be aware of your tone as well as your vocal inflection and deflection. When phoning: Pause after you say your name. This allows you to be in control of the conversation. They are waiting for you to start talking. Giving them your name makes the other person think a little about who you might be but after another short pause, give them a relief. Tell them that you have never met each other before (let them off the hook). Try and establish a connection: name drop so they make that connection between you and the mutual acquaintance. Ask them “is there any reason that I can’t help you”. This makes them have to think of a reason why not. In order to get the other person to engage more, ask them, “Can I show you what you I do” using a deflective tone! Makes it seem minimal. Acknowledge the other persons objection and move on! Keep going with closed ended questions. Make sure not to lie because they may back you into a corner! When to give up: When they hang up on you or after you have gotten three rejections. Sales is more emotional and mental than anything else. Goals are super, super important: they give you reasons to do things you don’t want to do! Therefore, write down your goals! 1. Navigating the place setting is as simple as b (bread on the left) and d (drinks on the right) or BMW. Your Bread plate is on the left of your meal, your Meal is in the middle, your Water or drinks are on the right of your meal. 2. Put your napkin on your lap as soon as you sit down or when the host does. If you get up during the meal, put your napkin on your chair. At the end of the meal put your napkin on the left of your plate, slightly crumpled up. 3. To eat a dinner roll or bread slice break a small piece off with your fingers, butter just that piece and eat it. Repeat. Don’t cut your roll in half with a knife and butter the whole thing. 4. If you drop a utensil on the floor don’t pick it up. Ask the waiter for a replacement. 5. As the host, share what dishes you recommend with your guest. It is best to suggest items that are mid-price range so you don’t look ostentatious. 6. When faced with many utensils always start with the ones farthest from the plate and work your way in towards the plate. This is known as “outside in”. 7. Make a toast when the first course is served. You may say “cheers” or make a specific toast directed at your guest or guests. 8. Once your utensils have been used don’t let them touch the table again. Keep them on a plate. 9. To signal to the waiter that you are still eating (American Style), place your knife at the top of your plate and your fork at 4:20 on your plate. To show you are finished eating, place your silverware side by side at 4:20 on your plate and don’t push your plate away when you’re finished eating. 10. Don’t make a big deal if you find a hair or bug in your meal. Let the server know about the problem and don’t alert everyone at the table. 11. At a business meal, start talking business after exchanging pleasantries and placing the order. 12. To be a good conversationalist, be a good listener. Ask questions and show a sincere interest. 13. Don’t complain, gossip or talk about controversial topics like politics, money or religion. 14. Turn your cell phone off when with others and don’t answer calls. If it is absolutely necessary to take a call, apologize, excuse yourself and move to an isolated area to talk. 15. Don’t place your wallet, purse, cell phone or other non-meal related items on the table during the meal. Accountability: Each day you should set goals and hold yourself accountable to them. Focus on what you can control and work on those. Focus on your why. Why is what you are doing important to you? How are you benefiting from it/what are you getting from it? Learning: Each book you read is two to three years of sales experience. Use books as a way to gain information that the author has gained over their years of experience. Also, learn from those who are doing well within the position you are trying to succeed in. “View the top performers as a professor (take notes)”. Keep learning in mind during an interview. Ask a lot of questions! Positivity: Do you fail from your failures or do you learn from them? Know why you’re doing what you’re doing and keep this in mind in order to achieve your goals. Force yourself to keep a positive mindset and do positive self talk. You’re either talking to yourself or you’re listening to yourself! Results/Winning: Focus on what you can control. Sales positions can be very overwhelming but if you set your daily wins and hold yourself accountable to them you will win! Valuing your time during golden hours and you will win more. Greater chances to win. How do you differentiate Slalom - or any firm? How do we impact how a client feels? The second two can’t be taught. DOUG WRAY || A1a, Inc.
Doug, Alli, Bobby, and Angela: What makes your industry unique? · Angela: You have to be not only very knowledgeable about your own product, but those of competitors as well to help better position your own in a given situation. What made you pursue Medical Technology as a career? · Doug: Having the opportunity to build such close relationships with customers (doctors), it’s something truly unique to this industry. 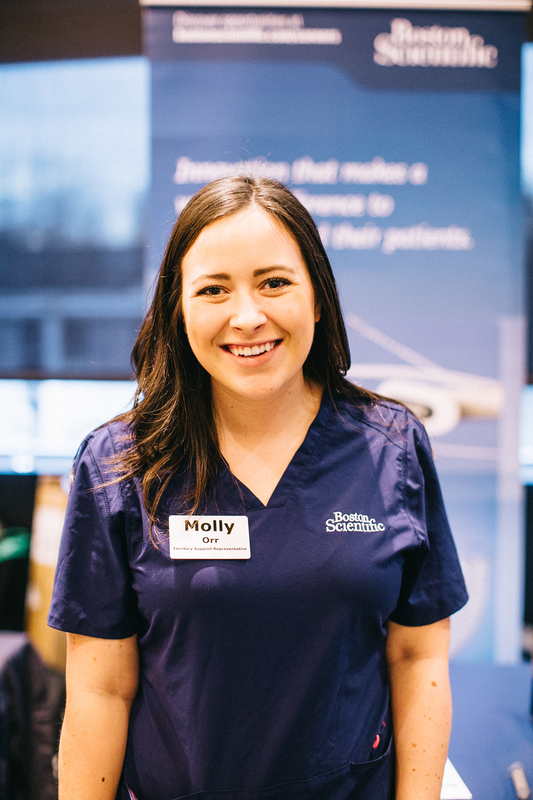 · Alli: I was interested in working in a career that enabled me to help people be healthy again, but without having to go through medical school, and this was the most natural fit for me. What’s some advice you have for someone wishing to pursue a career in the Medical Technology industry? · Doug: You have to be okay with having a flexible schedule, surgeries can often times take longer than expected, so you won’t always know when your workday will end. · Alli: If you don’t know the answer to a question while in the operating room, it’s important to ask why they’re asking the question. That way, you can find the best possible way to answer the question. · Bobby: Always be willing to learn. The industry changes so quickly that you always have to up to date with the latest technology and trends. We encourage our employees to share new articles with each other. · Angela: Build a strong business acumen. In my experience, some of the best employees we’ve had are the ones that aren’t necessarily the most knowledgeable when it comes to science, but ones that have strong business acumen. Eric spent the night talking about and going over the results from the Harrison Assessment that members took the previous week. Spending 8hrs a day doing what? What is Go-to-Market (GTM) Strategy? An action plan that specifies how a company will acquire customers and achieve a competitive advantage? How do we provide the best customer experience? What is your customer looking to accomplish? How long is your sales cycle? What is the length of your average contract? How many buyers are involved in your sales process? What does on-boarding and training look like at your company? How many people have been promoted? To which functions? Relocated into a Region of the U.S.
Hunter, Karl, and Daniel: What makes your industry unique? Daniel: The tech industry is ever-changing. Karl: Cost of entry is low and there’s a lot to learn. Any business would need your services. Jon, Amanda, Christopher: What does a sales role at your company look like? Jonathan: Where the company is going is driven by sales. Entry-level role has a lot of training. You’re on a small team with one manager who acts as a mentor. Get your own territory after first promotion. Every territory rep sells everything. Amanda: Sales Management Training Program as a launchpad for many different possible roles. Can manage a team of a 11 after 15 months. Can see an impact on small mom & pop shops all the way up to suite level. Jon, Daniel, Amanda:Why outside sales? If you have had experience in both an inside and outside sales role, which did you like better and why? Amanda: Outside. Loves interacting with people. Would hate to be tied to a desk all day. Always changing and every day poses new challenges. Daniel: Outside vs. Inside sales vary by company;Make sure to define that at each company you look like. At TEKsystems you are the inside and outside rep. Loves impacting people through his job. All about the people all the way through. Karl: Always understand the customer’s situation. Listening is the best way to get to that point. Hunter: Work-life balance is cyclical. Be comfortable being uncomfortable; that’s sales. Make sure you surround yourself with people who have the same mindset as you. Biography - similar to a brand statement, no more than four sentences. Education - all degree programs you are participating in. What types of jobs/internships are you interested in? What cities/states are you interested in working? Commodity Products or Highly differentiated? What are you willing to do to make sure you achieve this goal? On Tuesday, October 24th, we welcomed DocuSign's Meredith Wellnitz and Kate Londgren. DocuSign is changing how business gets done by empowering more than 300,000 companies and 200 million users in 188 countries to sign, send and manage documents anytime, anywhere, on any device, with confidence. They are a paperless company replacing faxing, printing, and scanning. Know the basics - What brings you here today? On Tuesday, October 17th, we welcomed MCM / Assured Partners' Matt Hoskinson, Katrina Johnson and Lorrie Baldevia. MCM/Assured Partners is one of the fastest-growing, independent insurance organizations in the nation. They are also an industry leader in employee benefits, executive benefits, retirement plans, insurance advisory and property & casualty. Some of their values include supporting their communities, putting clients first and also setting high standards for expertise and personal service. They Presented the topic, Business Etiquette & Why Insurance is Cool. On Tuesday, April 19th, we welcomed the author of “First Job, First Paycheck,” Jeff Lehman. As a business executive with 30+ years of management experience, Jeff has used his expertise to counsel several companies on how to increase their market value. He also gives back to the community through active involvement in the professional sales programs at the University of Central Florida and the University of Washington; Both of which have won championships at various national and international sales competitions. Hands down, Jeff’s book “First Job, First Paycheck” is the perfect read for a college student transitioning into adulthood. It is divided into three main categories providing insight on how to: land your first job, get the most out of that job, and then how to handle the compensation and responsibilities associated with the first paycheck. If you’re interested in purchasing a copy for $5, come to next Tuesday night’s meeting or email huskysalesclub@gmail.com! As college students, we’re used to a comfortable routine. We wake up for class, study at the library for hours, and are surrounded by many like-minded people sharing similar goals and interests. Upon graduation, we will be some of the youngest within an organization and there will be a lot of responsibility on our shoulders that we aren’t used to. Instead of being hard on ourselves, we must realize that the first two years in the workforce are naturally going to be shocking and disorienting. Don’t beat yourself up, it will get better. There are a lot of myths perpetuated in life. Never assume that the “way it’s always been” is the “way it should always be.” If you have a great idea or a new system that works better than the one in place, speak up and challenge the status quo. When doing this, keep a few other things in mind as well..
Often times you hear people say “do what you’re passionate about and the money will follow.” Wrong. Although you’re passionate about something, that doesn’t necessarily mean that you will find monetary success in it. Instead, live life with the willingness to find passion in whatever you pursue and you will be happier in the long run. Your success in life is directly related to the quality of the questions you ask and what you do with the answers, so get good at asking them. If you can listen and creatively solve problems - whether that be in the workplace or in your personal life - opportunities for success will be at your disposal. A Pulitzer award-winning writer proofed Jeff Lehman’s book and there were still a handful of typos overlooked. Mistakes are natural and perfection is unrealistic. What looks perfect today will look imperfect to you tomorrow, so try your hardest and do your best but don’t be discouraged if the outcome isn’t exemplary. “I’m one of your business’s biggest supporters, I’ve used your product for years." Where is your customer at in their decision making process? Brahm Heyman visited Husky Sales Club last week on behalf of ClearSlide, a company that has revolutionized the sales industry through and through. Presenting on the topic, "Prospecting: A look into the Sales Funnel," Brahm provided us with the ultimate guide to creating a strong customer base within your business. For those who missed the meeting, don’t worry, we’ll catch you up. First things first, what is this whole “sales funnel” thing and why does it matter? A lead is someone who is newly aware of your company or someone you have decided to pursue for a sale but has yet to be exposed to your company - You can also subcategorize further into what we call a qualified lead, someone that meets the qualifications of becoming a customer in the long run. The definition of what a prospect looks like entirely depends on your company. Often times the term is used interchangeably with qualified lead, but generally a prospect is someone who has been introduced to and is interested in further contact with your company. All prospects are leads, not all leads are prospects. You know what a customer is so we won’t dive in too deeply on this one. Customers are people who have made a purchase, simple as that. Although this is a very simplified introduction to the sales funnel, hopefully you now understand the bigger picture of the process. Later this month, Husky Sales Club executive member Alley Calkins will dive deeper into the subject matter on our Student-to-Student blog post - So be on the look out for that article! If you’re interested in learning more about ClearSlide, feel free to reach out to Brahm Heyman on LinkedIn or visit the company’s website. Sales Executive and Management Consultant Kevin Fulton joined us Tuesday night on behalf of Palo Alto Networks. As a next-generation security company, Palo Alto Networks is leading a new era in cybersecurity by enabling organizations to confidently pursue a digital-first strategy as they implement key technology initiatives within the cloud and mobile networks, while also maintaining complete visibility and control to protect their most valued data assets and critical control systems. Forbes: "Do You Know Your Why?" This past Tuesday was HSC’s first collaboration this school year with a company that is involved in medical device sales. Boston Scientific is dedicated to transforming lives by focusing on their investment in meaningful innovation in order to better serve their global patients, customers, and communities with the greatest level of care and compassion. Their products and technologies are used to diagnose or treat a wide range of medical conditions, including heart, digestive, pulmonary, vascular, urological, women's health, and chronic pain conditions. Jeff Kuhl, the Global Manager of Sales Training in Endoscopy spoke to us about "creating customer loyalty: what works in today's complex sales world." With such a rapidly changing world, customers now have complete price transparency and access to unlimited information when it comes to evaluating their purchase alternatives. The number of stakeholders in a purchasing decision has also increased, thus making the sales process more complex. Through the Product – knowing everything there is to know about the product and the benefits that come along with its features. Through Customization – asking the right questions to determine the exact needs of a customer. Through Teaching the Customer How to Run a Better Business – informing the customer on what they are missing and then providing a solution for them to improve. When training his team on how to “teach,” Jeff advises his team to understand their customers’ businesses and to see the world through their eyes, identify how you can help a customer reach their business goals, and then teach to the solutions that Boston Scientific provides. We are glad to have heard from Boston Scientific and this was a fantastic opportunity to learn from someone who boasts an impressive track record of surpassing his own sales plans and objectives. HSC had the opportunity to host The NuWest Group, a collection of well-established recruiting services brands. They have divisions in Healthcare, Engineering (Mechanical, Electrical, Manufacturing and Information Technology), and the Sciences. NuWest Group voted one of 2015’s top 100 Best Places to Work in Washington and the Eastside’s 50 Fastest Growing Companies according to the Puget Sound Business Journal! Representing the company was Liz Weber, a director responsible for growing the best team of engineering recruiting professionals. She spoke to us about being "inside the mind of a hiring manager." 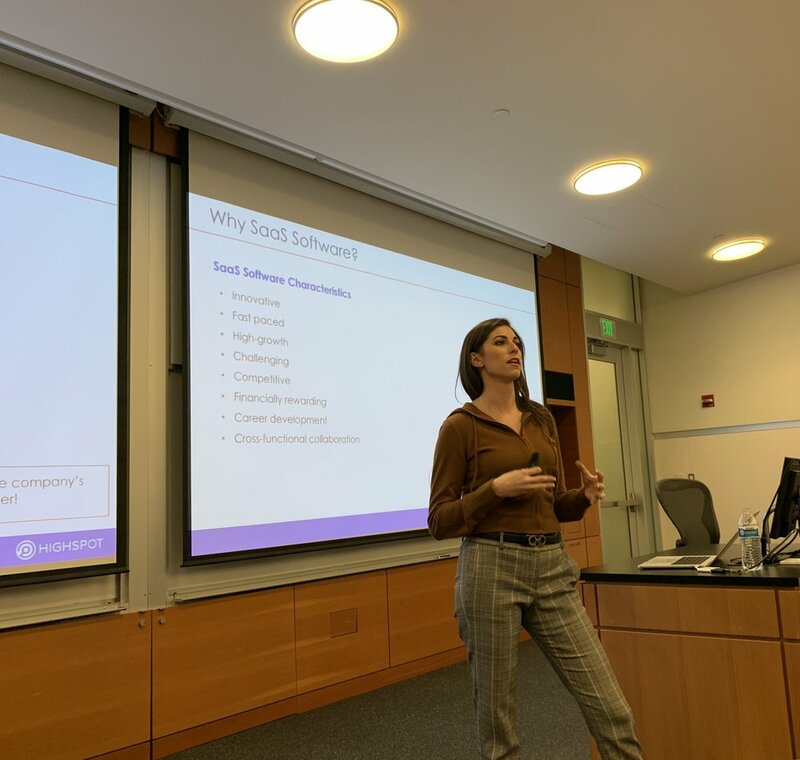 More specifically, she showed us the three main similarities between being in a sales position and going through the job hunting process: understanding your audience, having pleasant persistence, and ongoing networking. On top of this information, Liz reminded us all that recruiters and recruiting managers place a lot of significance on extracurricular activities. It is the best way for students to better understand the world and the people around them, as well as capitalize on an opportunity to develop leadership abilities. The most important things recruiters look for in candidates are: internships, employment during college, volunteer experience, and extracurricular activities. Liz has a total of 19 years of technical recruiting and business development. We are lucky to have her insight as we begin our own job hunts! As one of the world’s most prominent food and beverage companies with over $66 billion generated in annual revenue, PepsiCo withholds a global portfolio of diverse and beloved brands, including Frito-Lay, Gatorade, Pepsi-Cola, Quaker, and Tropicana. On Tuesday night we welcomed Cortnee Crane, one of PepsiCo’s current Senior Key Account Managers. Cortnee began her presentation by encouraging students who are interviewing for jobs and internships to begin the process by first “focusing on fit.” By this she suggested starting with internal reflection in order to assess whether a prospective company aligns with your values or not. Moving forward, recognize that no experience is too small and never neglect the small wins you have along way. So what if you don’t get your dream internship this time around? You will still gain vital interviewing experience and learn a bit more about the strengths and weaknesses you need to work on moving forward. Towards the end of our time with PepsiCo, Cortnee gave us some insight as to what it means to be a strong leader in the workforce. Perhaps the strongest piece of advice she gave our audience was, “denial can be the greatest hurdle that leaders face in becoming self-aware, but authentic leaders ask for and listen to honest feedback.” For more information on how to thoroughly prepare for your future career, Cortnee suggests reading U R A Brand by Catherine Kaputa and Play Like a Man, Win Like a Woman by Gail Evans. Click here for more information on upcoming opportunities at PepsiCo. Every year, Husky Sales Club teams up with some of the Pacific Northwest’s most renowned organizations to put on one of UW’s most prominent career fairs. On the morning of Tuesday February 2nd, our executive team and brand ambassadors diligently prepared Anthony’s Forum for 37 companies and 200 undergraduate students to gather in that afternoon. Around 12:30 pm – thirty minutes before kick off– Undergraduates dressed in their best business attire did some last minute preparation by organizing their portfolios filled full with resumes and business cards. From the moment the event began all the way to its final hour, the energy shared between the recruiters and students was incredible. It’s safe to say that without the direction of our VP of Events, Mackenzie Kruger, the career fair wouldn’t have been nearly as successful as it was. We would also like to thank all of the following companies and representatives on their behalf for making the event so special. From the support you give the Professional Sales Program to the opportunities you share with our students, the difference you make on campus is immense. One of the biggest takeaways from the meeting was an introduction to DISC, a behavior assessment tool that focuses on four different behavioral traits: dominance, influence, steadiness, and compliance. To begin, Toni Morris asked our students to look at the chart below and determine which category our traits aligned best with. From there we broke up into four teams, mingled a bit, and then prepared to play a game testing our newfound DISC knowledge. First, Toni would show us a video of a simulated meeting with a company executive and then out loud ask which behavior trait(s) the executive resonated the most with. Teams rushed to quickly collaborate ideas and shout out an answer – The ‘Dominants’ to no surprise won more often than not. 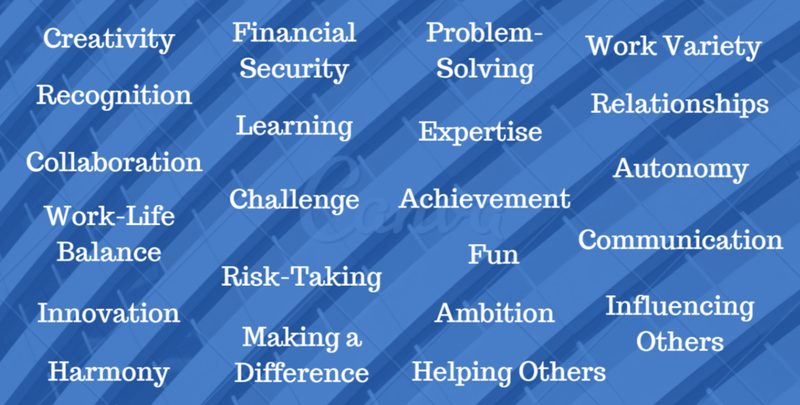 What are some characteristics of an Entrepreneur? On the contrary, what are some characteristics that don’t align with an Entrepreneur’s Mindset? One is not naturally born with substance; it is something gained over time and through experience. Similar to an entrepreneur’s mindset, aim to surround yourself with an environment that enables personal growth and provides your life with substance. Recognize that to any outcome, there are two contributing parts we must consider. Often times it’s easy to simply dwell on the event at hand rather than focusing on our response to the situation instead. It is imperative to assess situations with the intent to find a solution, especially if you desire a positive outcome. You may not be able to control the event itself but the way in which you respond is in your power. It is always a pleasure to network with Pacific Office Automation, feel free to reach out to Aaron and Jonathan if you would like to get to know more about their organization. 1. Live day to day and aim to be the best version of yourself that you can be. 2. There are no secrets, only systems. If you ever find yourself in a moment of uncertainty, there's probably someone out there that has gone through a similar situation. Emulate their methods of success and remember that developing a system to solve a problem will provide you the very leverage you need. 3. Mastery is not always exponential. Similar to working on your golf game, sometimes one gets worse before they get better. That said, if you are rather process focused with humility and hunger for success rather than results focused with a big ego, the better results you will obtain. 4. Challenge those around you and have the courage to tell others the truth – But always with kindness. 5. Say it out loud. Studies show that what you hear yourself say strongly correlates with what you eventually believe. Daily positive affirmation can be more powerful than you think, so don’t be afraid to wake up in the morning and say “today is going to be a great day” out loud – Even if you look crazy doing so. 6. Surround yourself with good people. Easier said than done, but perhaps the hardest part is recognizing those who are holding you back rather than those propelling you forward. Take a moment to assess your friendships and have the courage to know when someone’s influence does more harm than good. 7. Make your moments memorable. Invite those around you into your world and provide them with impressions founded upon quality versus quantity. Additionally, don't be afraid to thank those who have left an impact on your life. 8. Know your "why." Often times we focus upon what we're selling and how we're going to do it rather than why the sale matters. This can apply to really anything - For example, imagine you are in an interview. Rather than stating a bunch of experience you have and how you obtained it, instead start with why you are interviewing for that company and that specific position. This will set you apart from the crowd right off the bat. 9. The hardest part of any situation is what makes it great. If it were easy, everyone would do it - Face challenges head on with a competitive mindset and know that persistence, optimism, and hard work are the truest keys to success. HSC welcomed TEKsystems, the largest private talent management firm in the world, this past Tuesday. TEKsystems is a subsidiary of Allegis Group; they enable companies to develop a competitive advantage in their markets by providing expertise in IT Staffing Solutions, IT Services, and IT Talent Management. In general, when developing business relationships, Sarah challenged us all to truly think about certain relationships we have that don’t come easy. By doing this, we can learn how to overcome obstacles that prevent us from developing an emotional connection with someone else. It also makes us more aware of the people around us and how to better relate to diverse people and personalities. Amazon Web Services joined us on this past Tuesday to talk about Customer Acquisition and the Importance of Prospecting. AWS offers reliable, scalable, and inexpensive cloud computing services. Cloud computing makes it simple to access servers, storages, and databases through web applications. Matt Sullivan, the Head of Demand Generation, discussed with us the various challenges that salespeople face when prospecting. Some common challenges include finding the key decision-maker, getting past gatekeepers, mastering a pitch, and the fear of rejection. Matt informed us that executives actually want to talk to us. After long days of dealing with their managers and employees, they enjoy being interrupted from their jobs. That is why as salespeople, we must realize that the first conversations we have with executives are not selling opportunities, but rather a chance for us to make ourselves memorable. On top of that, Matt stressed the importance of finding touch points with executives and utilizing multiple mediums of contact in order for your value proposition to be absorbed. It is important to take advantage of calling and leaving voicemails, sending emails, messaging through LinkedIn, finding time for face-to-face interaction, and getting to know an executive’s assistant. 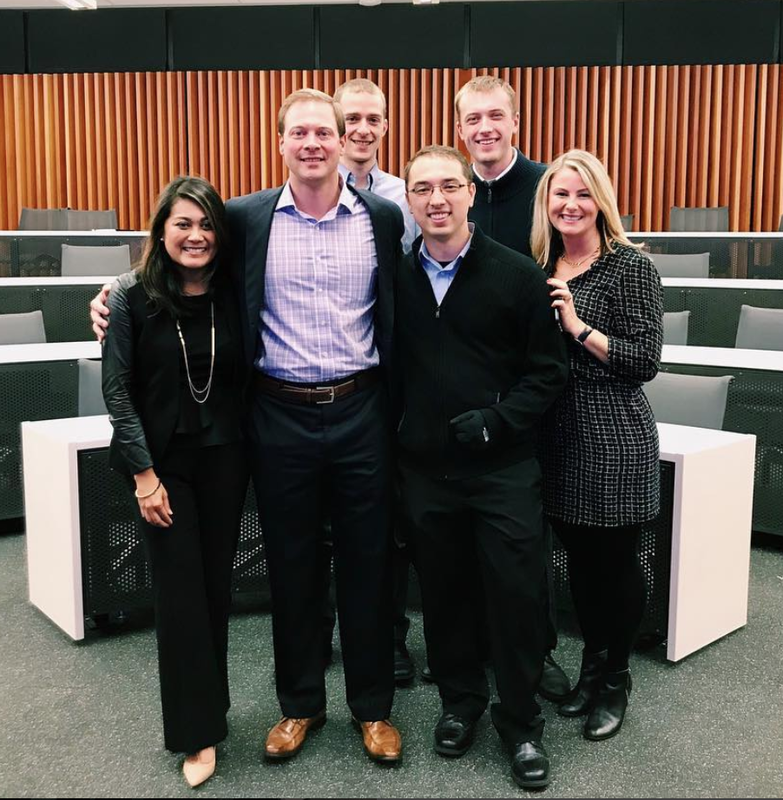 On October 28th, four University of Washington undergraduate sales students and Foster Professional Sales Program’s Assistant Advisor Rick Carter set out to Bloomington, IN to compete in the National Team Selling Competition at the Kelley School of Business. The students representing the University of Washington were Ty Beauchamp, Taya Ampleyeva, Makenzie Kruger, and Erik Meister (in order from left to right). The team received a seventy page long case study two weeks prior to the competition and spent upwards of one hundred hours in preparation for the competition. The competition took place from the 28th-30th of October and consisted of two phases. During the first phase the team had the opportunity to meet with their potential client for a needs analysis. The team then had the evening to tailor their presentation for the phase two: the sales meeting, which took place on the 30th. The University of Washington team performance was highly regarded by the judges from 3M and Altria. The Husky Sales Club had the opportunity to welcome BiNW this week. We were joined by the President and CEO, Sean O’Brien, and the Vice President of Sales, Don King. BiNW combines their knowledge, flexibility, and value together in order to deliver interior spaces that inspire users and improve efficiency. They have a partnership with Herman Miller to provide expertise in four main environments: Corporate, Learning, Healing, and Government. Don and Sean presented about “what customers look for in a salesperson.” People, in general, are always thinking about the acronym WIIFM: “What’s in it for me?” During the pre-call stages of a sales call, it is important for all salespeople to evaluate how they can create value for their customers; salespeople need to find a win-win strategy. Tableau Software joined the Husky Sales Club on November 3rd and shared with us their breakthrough products that change the way people use data. They have created easy-to-use software that helps people achieve greatness with data. Regional Sales Leader Monte Montemayor presented on “what it takes to stand out in a Sales Profession - both from the perspective of getting the job, as well as once you land the job.” We are lucky to have had him share his thoughts with us from the 25+ years of sales and sales leadership experience he has accumulated throughout his career. Empathy - being able to truly understand your customer's problems and the pressures they face in order to help them make the right business decisions. Curiosity - having the interest to constantly learn and know more than what is expected of you. Asking Questions - not only asking many questions, but also asking insightful questions. Understand what a company does, how the company does it, and why they do what they do. Research your interviewer and learn about their career path and experiences. Be prepared to offer 3 strong reasons for why you want to work at the company you are interviewing for. Be able to fully communicate what distinguishes you from the rest of the applicants. Talk about what you bring to the table and how you can create "lift" to the company. Know what you are looking for in a company, team environment, and in a boss and/or manager. Always prepare 2 questions specific to the company, 2 questions about the position you are interviewing for, and 1 personal question for the interviewer. What are some characteristics that past employees in this position had that lead them to success within the company? Always maintain strong eye contact and SMILE! Most importantly: Have FUN! You are a student at the University of Washington, that is an accomplishment in and of itself. With the slogan, "Your future begins now," Seattle Corporate Search is an organization that provides candidates professional representation through expert interview advice and feedback. Thank you to Brad Near and Katrina Moldskred for such an amazing resumé workshop! Both Brad and Katrina clearly expressed the importance of having an up-to-date resumé, as it is the best way to sell yourself. If you have any questions or would like to reach out to either Brad or Katrina for guidance on your resumé, they are both more than willing to provide you with their time and expertise! A big thank you to Altria Group Distribution Company for launching this year's speaker series for our club! AGDC owns and develops financially disciplined businesses that are leaders in providing adult tobacco and wine consumers with superior branded products. This organization is dedicated to developing leaders within the company, and it encourages creativity when it comes to improving the businesses they work with. We appreciated Chris Elebesunu talking to us about "how to use effective story telling to sell anything, even yourself." His insight is directly applicable to all students interested in a sales career, especially as we begin our interview processes for internships and full-time post-graduate positions. AGDC recruits directly from the University of Washington for summer internships and full-time positions. If you are interested in applying or learning more about the company, visit their website or contact Chris. On Tuesday, October 6th, The Foster Professional Sales Program worked in conjunction with the Husky Sales Club to bring together 80 students and 40 corporate and sales executives from sponsoring organizations, thus kick starting the first annual “Meet & Mingle” event. The goal of the event was to introduce sponsors of the Foster Professional Sales Program to exceptional UW students interested in pursuing a career in sales. The event was a huge success, receiving only positive feedback from both students and sponsors alike. The sponsoring attendees represented companies ranging from small local business to global firms including: Amazon, Frito Lay, Medallia, TEKsystems, Docusign, PepsiCo, Zones, Liberty Mutual Insurance, Northwestern Mutual, Palo Alto Networks, Pacific Resource Group, Boston Scientific, Laird Plastics, Altria, King 5, QBSI-Xerox, and Tableau. Presenters at the event included The Foster Professional Sales Program’s Director and Assistant Director Jack Rhodes and Rick Carter, as well as the Husky Sales Club's very own President and Vice President of Operations Spencer Toms and David Gilluly. To top it all off, Eric Aslakson, the managing partner for Northwestern Mutual and the keynote speaker for this year's event, spoke about professional networking and the value at any age of being a student of success. He explained that great companies are always in the process of interviewing, even in networking settings. Furthermore, he stressed the importance of effective networking through strategic planning in order to develop a diverse network. We want to thank our sponsors, UW faculty, and the students who attended for making this a memorable night!